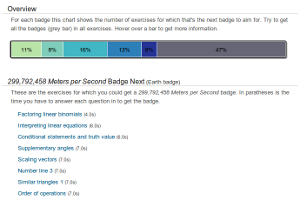 This site analyses data from Khan Academy to help you find the easiest way to get more badges. What are the shortest videos on Khan Academy? What are the newest videos on Khan Academy? 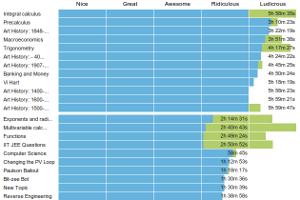 How many hours of videos are there on Khan Academy? How many videos on Khan Academy were not made by Sal? How fast do I have to answer a question in order to get a Streak badge? How much longer do I need to listen to playlist for to get a Listener badge? How many more exercises do I need to get right to get a Streak badge? How many exercises have I done all together? How long have I been a member of Khan Academy? This website was created by Peter Collingridge. I don't work at Khan Academy, I just use it a lot. You can find out more about me via my website. If you have any comments, requests or feedback, please contact me. My Khan Academy profile is here. This product uses the Khan Academy API but is not endorsed or certified by Khan Academy (www.khanacademy.org). It was created by Peter Collingridge.